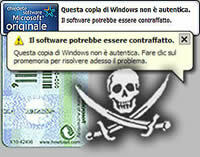 Security researchers have identified a worm virus masked to appear as Microsoft’s Windows Genuine Advantage anti-piracy program, while end users have filed a second lawsuit against the software giant’s use of the actual program. Workers at anti-virus specialist Sophos were among the first to unearth the worm disguising itself as WGA. Dubbed by the firm as Cuebot-K, the virus is spreading over AOL’s popular instant messaging network posing as Microsoft’s controversial anti-piracy software. Sophos said Cuebot-K is registering itself on infected PCs as a new system driver service named “wgavn” that also bears the public display name of “Windows Genuine Advantage Validation Notification.” The virus automatically runs during system startup, and users who view the list of services offered by the threat are informed that removing or stopping the service will result in system instability. Microsoft representatives didn’t immediately return calls seeking comment on the WGA-themed virus. Adding to the company’s headaches over WGA, Microsoft has also been hit with a second class-action lawsuit filed over the capabilities of a previous version of the anti-piracy software. Click here to read more about the first lawsuit. In a case filed on June 29 in the United States District Court of Seattle, plaintiffs Engineered Process Controls and Univex, along with individual end users David DiDomizio, Edward Misfud and Martin Sifuentes, have charged that Microsoft’s technology amounts to a form of spyware. The suit specifically contends that Microsoft intentionally duped its customers by delivering WGA as part of a critical security update without telling them that the anti-piracy program would secretly communicate with its own servers. Since the program “gathers data that can easily identify individual PCs,” including a machine’s IP address and BIOS information, and could potentially be used to gather other types of information, it is akin to malicious threats, the suit claims. In doing so, WGA violates Washington’s existing anti-spyware laws, according to the suit, which mirrors a similar claim filed by a California man on June 26. That legal action, brought forward in the U.S. District Court in Seattle by Los Angeles resident Brian Johnson, claims that Microsoft failed to properly disclose all the details of WGA when the technology, meant to help stop the widespread pirating of Microsoft’s Windows operating system, was upgraded in April. Click here to read more about the WGA Notifications controversy. While WGA was first introduced in 2004, the suit alleges that the feature became similar to a form of spyware when it was expanded to include a system that made contact with Microsoft’s servers to help the company identify people who may be using pirated versions of its market-leading operating system. The updated version of the WGA tool included two separate components, WGA Validation and WGA Notifications, which, respectively, promised to determine whether a copy of Windows is pirated or not and alert users who Microsoft believes are running illegal copies of its software. However, WGA’s notification aspect was discovered to have been “phoning home” to Microsoft’s servers on a daily basis, touching off a wave of controversy among those who believe the feature could be used by Microsoft to keep tabs on people using its software.